Today I presented a 101 session on getting started with the new SharePoint App Model. It’s a lot to get through in 75mins, but hopefully it gave people enough to get started and try out building an app for Office 365 or SharePoint on premises. Thanks to everyone that came along! #SPSChicago is a great free event for people with a great lineup of speakers. This entry was posted in Cloud, Development, Office 365, SharePoint on November 2, 2013 by Chris Johnson. A colleague Brendon Ford , and Office 365 MVP I would add, pointed me at a great resource today for keeping up with what Yammer are up to in terms of new stuff coming down the line. This gives a reasonable amount of detail on the things they are working on and at what stage they are at. I say reasonable because they don’t give hard dates on when things will release, but they do give some detail on what is coming. 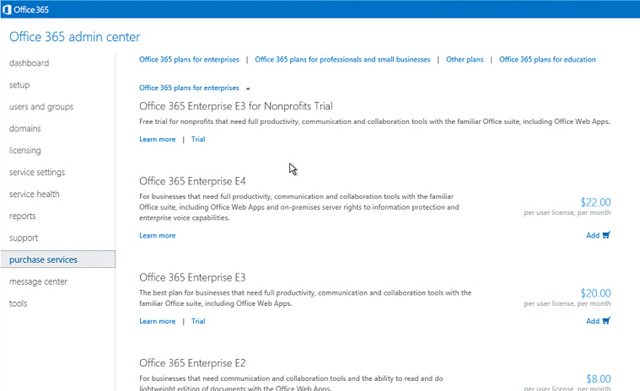 Here are some examples that specifically relate to Office 365. This is pretty cool insight into what’s coming. 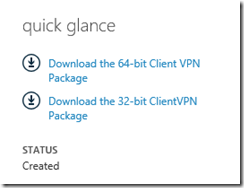 When are we going to get this level of visibility into the core Office 365 products? 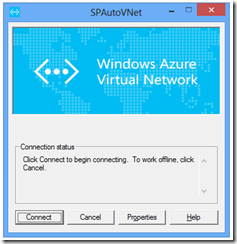 Exchange, Lync and SharePoint? One of the big issues we face with customers in Office 365 is having zero visibility into when things change. We are not alone, Jeremy has a good write up about some issues they have faced with APIs changed unexpectedly. Release and Update schedule. Notes on exactly what is coming and when (per tenant). Dev sandbox. 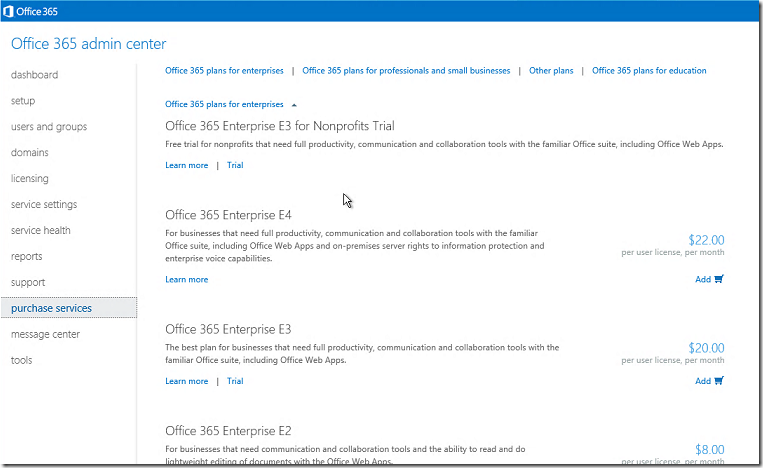 Ability to ask for a temporary test tenancy on a particular “version” of the service/product so that customers and partners can test their other systems that integrate with Office 365. Postponement. The ability to ask for a postponement of an update for up to 30 days. 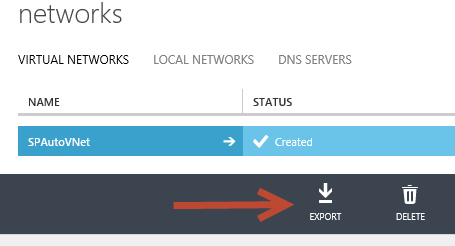 This would give customers/partners time to test and fix up any issues. Open dialog with trusted advisors. Microsoft was built on the back of strong partnerships. Having a group of trusted advisors with a Bat Phone to someone who cares in engineering would go a long way. This group wouldn’t need to be big, but would be of good people who get it. People who want to help MS get better, not moan about it publically. I think with some of the above changes proposed that things would get A LOT better really quickly. This entry was posted in Cloud, Office 365, SharePoint on October 7, 2013 by Chris Johnson. Today Mary Jo Foley wrote a piece about Microsoft losing the fight with British Sky Broadcasting Group over the name SkyDrive and in particular (as I understand it) in the “Sky” part of that. In that article she also mentions that this will likely effect the SkyDrive Pro product naming also. Which perked my ears up given its SharePoint linkage. I never liked the SkyDrive Pro name. Why? Primarily because it makes it sound like it has something to do with SkyDrive and cloud storage. When in reality you can use SkyDrive Pro to sync files from your on-prem SharePoint system … which doesn’t feel particularly “Sky” or “Cloudy” to me! It just confuses everyone I speak with. I can see what Microsoft were trying to achieve with regards to Office 365 and syncing files … it makes a little more sense in that regard. However, I always had a problem with it “hooking” on to the consumer brand of SkyDrive. They are 100% totally separate products, no technical similarities etc… The only similarity is that they sync files to your PC from somewhere. I actually think having to rename SkyDrive is a blessing in disguise for Microsoft. Now is the perfect time to get it right and clear up all the confusion! To make naming and technology matters worse Windows Server 2012 R2 is introducing a feature called “Work Folders” which enables access to on-prem file shares remotely. The reason being that 1000s of customers have files in shares and will continue to do so & therefore it would be good to have access to those remotely. You can read about Work Folders here: Introducing Work Folders on Windows Server 2012 R2 It’s actually a pretty nifty solution. SkyDrive Pro – which allows you to sync files from Office 365 and from SharePoint on-prem. Work Folders – which allows you to access files from file shares on-prem. Wouldn’t it be sensible for Microsoft to release ONE Enterprise grade file sync/access tool that let you access files from Office 365, SharePoint on-prem and file shares on-prem? I call it “Files”. Users would never see that name however as it would show up branded/renamed in Explorer, iOS, Windows 8 and Windows Phone using the organizations logo and name e.g. “Contoso Files”. In that one location you would see a list of “folders” that either belong in SharePoint on-prem, Office 365 or Work Folders (file shares on prem). Is this really too much to ask for? With branding up in the air it would be a good time to strike and fix the mess up. However, I suspect it will take a while for this to happen and we are likely to see a name change first in the coming weeks/month (after all its a Select All replace right?! :)) and a consolidated product down the line (all fingers crossed). What do you think should happen? or what would you like to see from Microsoft to make your file sync and management simpler? This entry was posted in Cloud, Office 365, SharePoint, Work Folders on July 31, 2013 by Chris Johnson. 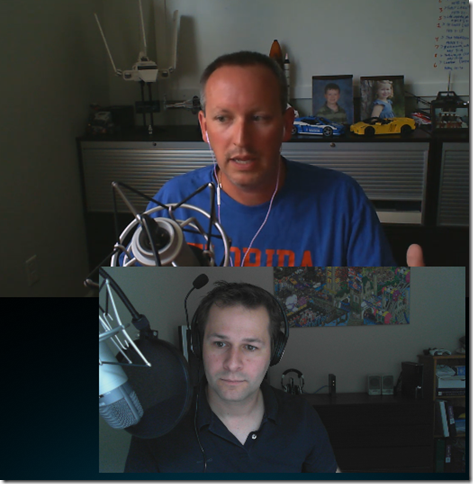 On Wednesday last week I had the pleasure of participating in my first SPChat over on the SharePoint-Community.net site. These are online Q&A based chats where an “expert” is invited and questions are fielded in real time from the live audience. Each chat has a topic, but anything goes within that topic. My topic was about the new SharePoint application model for developers is SharePoint 2013 and Office 365. It was really fun fielding questions, but i also felt like my typing was slow and it was hard for me to temper my answers with knowing that i wanted to get as many questions answered as possible. Questions ranged from the app store submission process to app domain isolation, to tools i use in app development and the financial side of apps. All interesting topics. I hope to do another one some day! 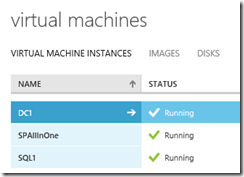 This entry was posted in Cloud, Development, SharePoint on July 29, 2013 by Chris Johnson. 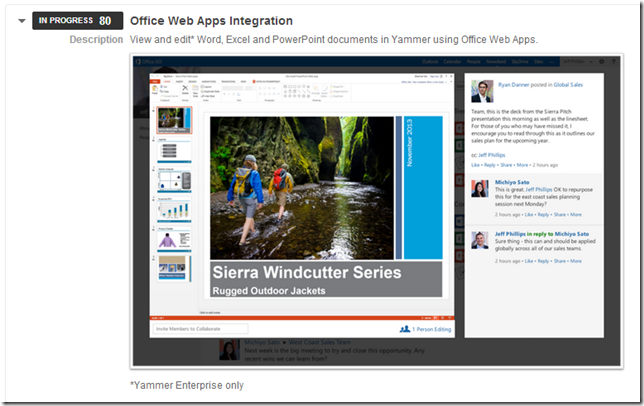 Integrating SharePoint Online and Yammer – An app for that! 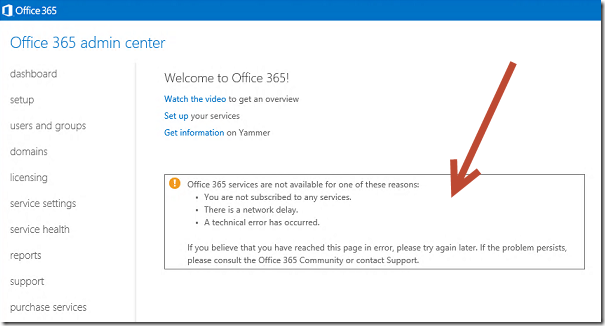 Way back at SPC12 (Nov 2012) the keynote included a demo that showed an example of the integration possible between SharePoint Online and Yammer that could be done with a little bit of development effort. I built that demo and decided to turn it into a real app anyone could use. Some Background first: This surfaced in SharePoint Online by way of a new ribbon button that when pressed posted the selected document to Yammer via the Yammer Open Graph API. It was shown pretty quickly and it was pretty easy to miss. However, it demonstrated a few interesting methods of integration that are possible today using the new SharePoint App plumbing and Yammers pretty decent set of APIs. 3. When it was clicked it posted to the Yammer activity feed. The image above shows the hover over the activity. The activity feed shows a scrolling history of activity in the the Yammer network. e.g. “Chris Johnson updated Product Catalog.docx”. Its like that thing in Facebook that shows you all the music that your mates are listening to that they probably don’t know they are publishing to all their friends via spotify. More on the Activity feed a little later on. This app is pretty simple. 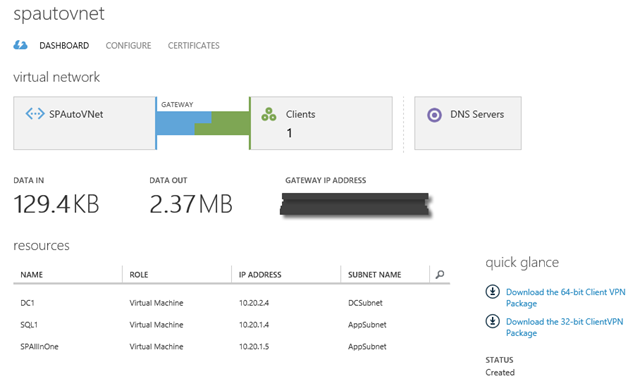 It’s a SharePoint Provider hosted application running in Azure Websites. The SharePoint part of the app includes some xml to add the ribbon button to all document libraries. When the user clicks the “Post to Yammer” button it sends some details about the document(s) to the backend of the app running in Azure. The backend code then uses the CSOM to call back into SharePoint to retrieve the name of the document and some other properties. Then the app directs the user through the Yammer OAuth authentication flow. 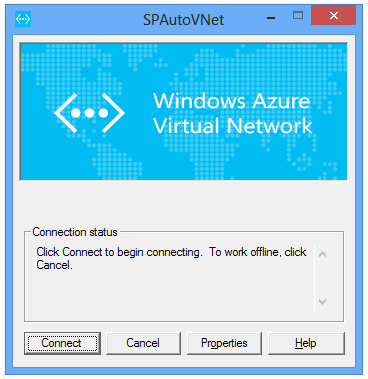 Once this is complete the app then is able to access Yammer on behalf of the user that signed in. 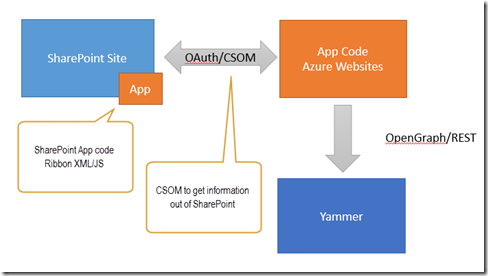 Finally the posting of the information includes posting to the Yammer activity stream using the OpenGraph APIs (JSON/REST based). It will also post to the main feed in Yammer too via the Messages REST API in Yammer. Both of these are easy to use and are fairly standard XML/JSON/REST based services. Recently there has been a bunch of noise about SharePoint’s current dual headed social story. 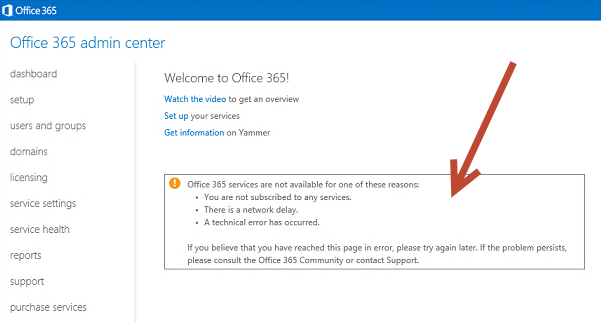 In the blue corner you have Yammer. The problem is that right now there is much consternation about how they don’t work nicely together. Things seem to be happening too slowly for some people. The products are currently not integrated all that well. That is slowly changing, like the ability to switch from the NewsFeed to Yammer in Office 365 that rolled out the day of writing this post. Those improvements will continue over time and eventually I think we will see the ability to totally replace the current out of the box social features with Yammer. How on earth people think Microsoft can magically mash together one product with another overnight and make it all work perfectly is beyond me. It will take time people! Just because you think you could have done in overnight doesn’t mean it works that way in huge software projects … better stop this rant now before i get carried away. The short story is that right now you have to pick one or the other. My vote is firmly in the Yammer category. But at the end of the day there are many factors that will go into your decision either way and there isn’t a perfect answer. You can do things today to help with this situation. The demo showed a very basic example of some custom integration using things we know exist today. … and you would be right. We are going to release this app to the store so that anyone with Office 365 can use it. It needed some tweaks to make it work well in production & some branding changes. However in the coming days/weeks we will release it under the name “ShareIt”. I am going to write a future post on how this app was created and it will include code to illustrate how to call the Yammer APIs. Note: It is very likely that this app will no longer be needed once MS do their thing and integrate the products further. I hope so to! This entry was posted in Cloud, Development, Office 365, SharePoint, Social, Yammer on June 7, 2013 by Chris Johnson. Pilers – just let their inbox grow to monumental size and rely on search etc… to find things. There are loads of these people around. Their inboxes grow to multiple GB and they never file or clear anything out. Filers – once they read an email and do whatever they need to do they delete it OR file it in a folder somewhere. They rely on both folder hierarchy and search to find email. I am a filer. I like having a folder for a particular project etc… I cant really say why … but it seems to work best for me. At Provoke we use Exchange Online for our email system. It rocks. MS look after it for us. We get 4GM mailbox sizes. In Exchange Online E3 you can get this nifty feature called an Online Archive. It lets you stick all sorts of stuff in there and it doesn’t go towards your mailbox quota. I have 100GB of this archive which is awesome. The other thing you need is a way to get mail into that archive. Enter policy! And then set a Policy to move mail to the archive after it gets to a particular age. 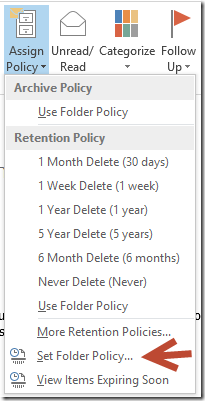 Policies inherit so you don’t have to do this on every folder. 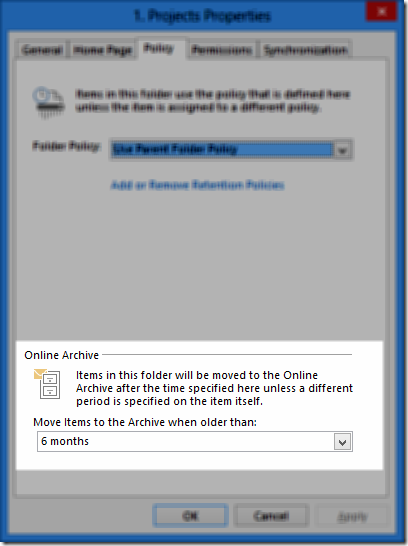 Then you set the Online Archive setting to a time period after which you want to move email to the archive. In my case I like 6 months. You access it via outlook or OWA just as you normally would. It shows up along side your mail mailbox. Another cool thing about this is that it frees up space in your offline mail store (OST) on your computer. The Online Archive is online available online … not when you are offline. No more email mailbox quota problems. NICE! This entry was posted in Cloud, Exchange, Office 365 on March 13, 2013 by Chris Johnson.